The most popular styles, from slouchy newsboy hats to a warm slouchy fisherman’s hat is represented in these patterns. Whether you have made socks before or this is your first time, you are going to find patterns you can’t help but fall in love with. Make a pair of each for everyone in your family, then make a pair for yourself. 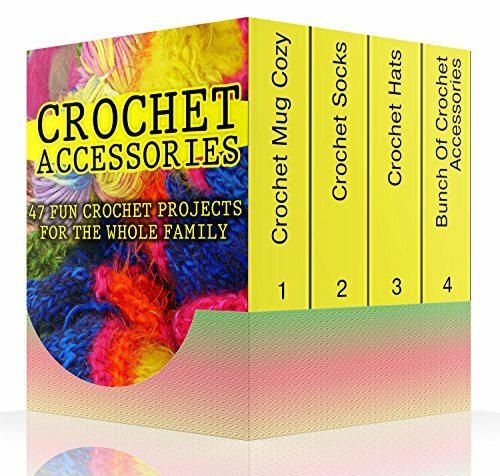 Book #3: Crochet Cozy: 15 Super Cute Crochet Cup Cozies That Will Make A Beautiful Gift! This book has enough patterns to make everyone on your list happy. All you need is a bit of yarn, a half hour of time, and a warm spot to sit back and whip up these thoughtful gifts. Make a few for yourself too, they are perfect for big cups that take a while to drink; you can take your time and enjoy without worrying about your coffee, tea, or cocoa getting cold! Crochet accessories let you express your creative side and look good doing it. There are many things you can create with some yarn and a crochet hook; you can make your own purse, a cowl to match your wardrobe, and even awesome jewelry. Accessories work up quickly and are the perfect pattern for beginners to try. Download your E book "Crochet Accessories: 47 Fun Crochet Projects For The Whole Family" by scrolling up and clicking "Buy Now with 1-Click" button!